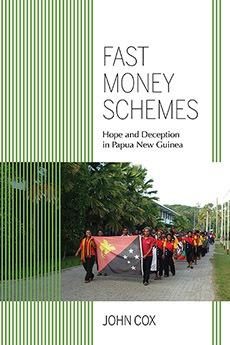 In the late 1990s and early 2000s a wave of Ponzi schemes swept through Papua New Guinea, Australia, and the Solomon Islands. The most notorious scheme, U-Vistract, attracted many thousands of investors, enticing them with promises of 100 percent interest to be paid monthly. Its founder, Noah Musingku, was a charismatic leader who promoted the scheme as a form of Christian mission and as the basis for establishing an independent kingdom. Fast Money Schemes uses in-depth interviews with investors, newspaper accounts, and participant observation to understand the scheme's appeal from the point of view of those who invested and lost, showing that organizers and investors alike understood the scheme as a way of accessing and participating in a global economy. John Cox delivers a "post-village" ethnography that gives insight into the lives of urban, middle-class Papua New Guineans, a group that is not familiar to US readers and that has seldom been a focus of anthropological interest. The book's concern with understanding the interweaving of morality, finance, and aspirations shared by a global cosmopolitan middle class has wide resonance beyond studies of Papua New Guinea and anthropology.